11 Even so consider yourselves to be dead to sin, but alive to God in Christ Jesus. 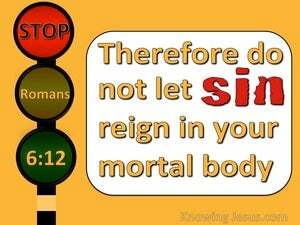 12 Therefore do not let sin reign in your mortal body so that you obey its lusts, 13 and do not go on presenting the members of your body to sin as instruments of unrighteousness; but present yourselves to God as those alive from the dead, and your members as instruments of righteousness to God. and when the LORD your God delivers them before you and you defeat them, then you shall utterly destroy them You shall make no covenant with them and show no favor to them.